She admitted that she did and laughed as she walked away. I channeled the diner scene in Five Easy Pieces for a moment but I let it go and had a glass of water with my meal. There is always at least one pitcher of tea in my refrigerator at any given time. I have never been much of a coffee drinker but I mostly fit the Southern stereotype about iced tea; I drink it frequently and year-round. A glass of iced tea is the first thing I pour when I get up in the morning and the first thing I pour when I come home at the end of the workday. I bring a thermal tumbler of iced tea to my office each day and am usually able to nurse it until time to go home. Iced tea is one of the many great things that was popularized during the St. Louis World’s Fair of 1904 but it goes back farther than that date. It is ubiquitous at Southern tables and in Southern restaurants and “sweet or unsweet?” is the standard question when iced tea is ordered in a restaurant in the South. When I am out, I usually order “sweet” but the sweet iced tea in restaurants is often a little too sweet for my taste. I like it a little sweet and what I make at home tends to be much less sweet than what is served at many restaurants, especially the chains. As I have become more wary of processed sugars, I have begun to use alternative sweeteners, sometimes with a little honey added, to sweeten my home-made tea. I was once given an electric iced tea maker as a gift. It seemed heretical at the time, but I got used to it, began to like the way I could easily add mint, orange peel, and other seasonal flavors into the mix, and even bought a new iced tea maker when the first one broke. My replacement broke a few months ago and I intended to replace it but haven’t gotten around to it yet. I am enjoying the stove-top process again although I had to tweak my formulas just a bit to get it right. Growing up, the teabags in our house and at Grandmother’s were usually Lipton and occasionally Red Diamond, a tea and coffee brand based in Birmingham, or Luzianne out of New Orleans. When I was out on my own, I gravitated to Lipton and that was my iced tea brand of choice for a long time. That all changed after Hurricane Katrina in 2005 when I heard on a television report that the Luzianne factory did not lay off any employees post-storm and, in fact, continued paying employees their full checks during the time that the operation was closed in the aftermath of the flood. I have not been able to confirm that story, but Luzianne became my iced tea brand of choice from then on. Such corporate loyalty to employees is rare these days and deserves our support. 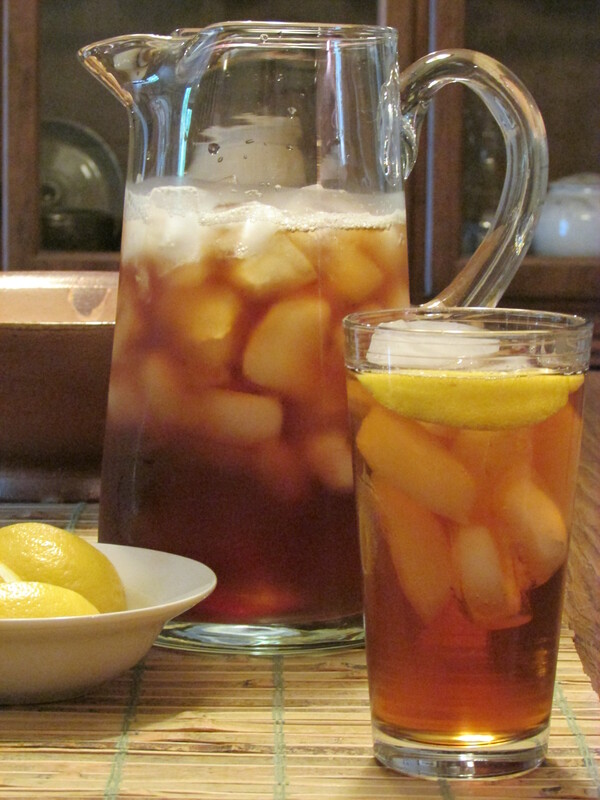 A key to serving iced tea is to have lemon wedges and long-handled teaspoons nearby. Also, one must always have plenty of ice cubes on hand. In the days before most refrigerators had ice dispensers, I would go into friends’ kitchens and fill their ice trays upon arrival if I knew these were people who were negligent about what I consider to be the essential task of constant in-home ice production. I still keep full ice trays in the freezer in case of an emergency. Last Christmas, friends who know my affinity for iced drinks gave me a gift of spherical ice — plastic contraptions that each produce one perfectly round and substantial circle of ice. They’re a modern miracle and a perfect gift – the ice globe is pleasing to look at, melts slowly, and just fits in an old-fashioned glass. Two will work for a tall glass of tea. At lunch on New Year’s Day, people were whipping out their phones like the paparazzi to photograph my drink with a round globe of ice sitting majestically inside. After a brutal Winter, it’s finally Spring and warmer weather is settling in. Wherever we live or travel, we should all be able to drink our fill of iced tea without having to explain ourselves. Back in 1989, during that same theatre tour that took me to New London, I was in a restaurant in downtown Burlington, Vermont, a few days before Christmas. The waiter asked for my drink order and I said “iced tea.” He wrote down my order and went back to the kitchen. A few minutes later, the owner of the restaurant came out from the back and introduced himself. “Where are you from?’ he asked. “I’m from South Carolina,” he said. “That’s why we serve iced tea in December.” It turned out that his wait staff had instructions to inform him whenever a patron ordered iced tea during cold months. He said that was always a signal that another Southerner was in the house. This entry was posted in iced tea, Luzianne and tagged Alabama, culture, iced tea, Luzianne, Southern food and drink, southern foodways on April 9, 2015 by gedwardjourney.